Later than planned (due to the organisers needing a photographer for the prizegiving - and muggins was first choice!) here is the final report from a rather sodden and wet Isle of Mull. 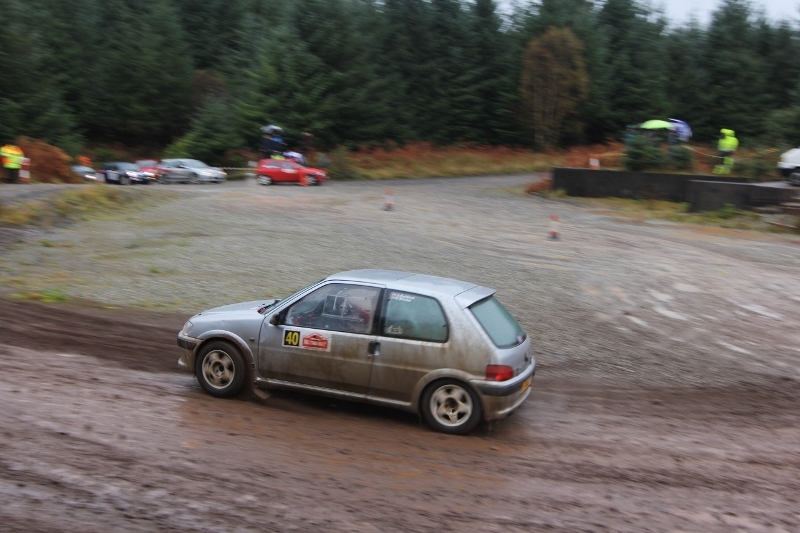 Bevan Blacker and Abi Ruddock splashed their way to victory on the Beatson’s Building Supplies Mull Targa Rally and led all the way from the start this morning in Tobermory. There was a bit of luck involved as Bevan nearly chucked it away in Test 11 when he got the arse end of the wee Peugeot in one ditch, then the other side, and back again before he got it all gathered together and back on track. Otherwise a faultless drive on his second visit to this event and first time with Abi. 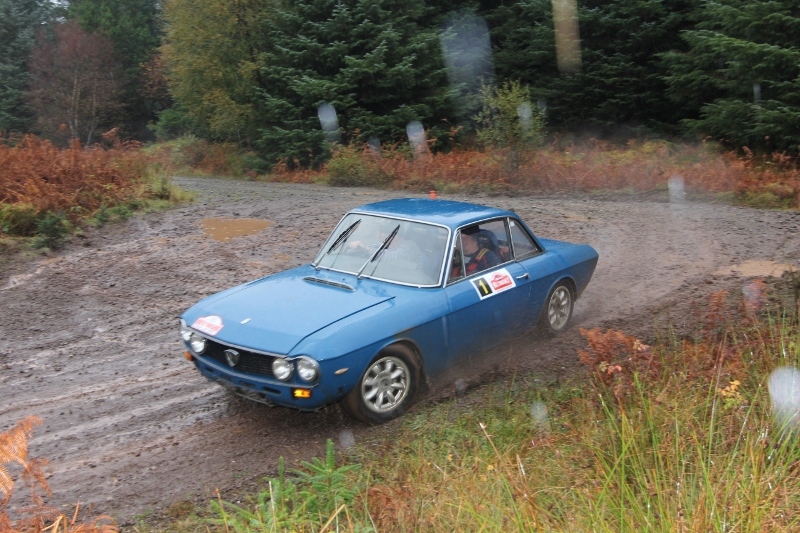 There was a tie for second place between the Suzuki of Geoff Dean and Suzanne Barker and the Lancia Fulvia of Andrew Johnson and Dave Boyes. The tie decider was faster time on the opening test of the day where Geoff was 4 seconds quicker but Andrew had been penalised 10 seconds for striking a cone. Top Scots were Craig Wallace and Clifford Auld in 7th place in the Corolla despite damaging a brake disc on the first stage of the day and carrying on despite some braking deficiency problems and no handbrake (just don’t tell the Polis) while Ryan Hay and Niall Thomson lost out on the top six by 7 seconds in their Toyota Paseo. Allan Clark had been in the hunt for top points early in the day till an alternator problem dropped his Avenger back while Alan Ross lost out on the top ten when he beached the Citroen in Test 11. 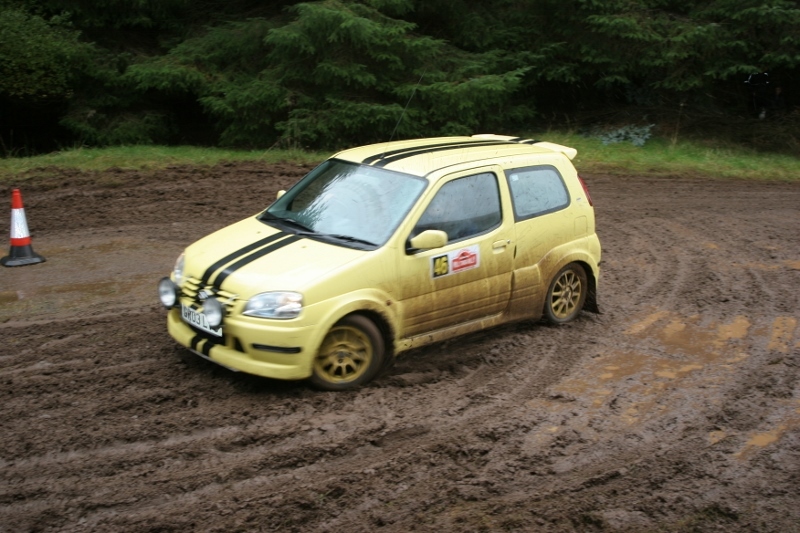 There were some other sterling performances from the ‘nutters brigade’ led by Fraser Hughes and Peter McInnes who left Tain this morning at 3am in their Mazda MX5, did the rally and then headed immediately for the last boat to get back home – and had no hood on the Mazda. Wet doesn’t cut it, neither does drookit, but there will undoubtedly be a ring round the inside of the cockpit just like their bath tub at home! And surely the best ‘Pace Note’ of the day was uttered by the normally cool, calm and collected Iain Thorburn: “No, No, No, No, No, where the f*** do you think you’re going?” as (Alan) Clarky ‘the Desperate Dairyman’ overshot a junction at full pelt. Full report to follow soon in the on-line mag.